You can move files and folders around within a window in OS X El Capitan to your heart’s content — as long as that window is set to Icon view. Just click and drag any icon to its new location in the window. If the icons won’t move, make sure View→Arrange By is set to None. Some people spend hours arranging icons in a window until they’re just so. But because using Icon view wastes so much screen space, you might want to avoid using icons in a window. You can’t move icons around in a window that is displayed in List, Column, or Cover Flow view, which makes total sense when you think about it. (Well, you can move them to put them in a different folder in List, Column, or Cover Flow view, but that’s not moving them around, really.) And you can’t move icons around in a window under the spell of the Arrange By command. As you probably expect from Apple by now, you have choices for how you move one file or folder into another folder. You can use these techniques to move any icon (folder, document, alias, or program icon) into folders or onto other disks. Drag an icon onto a folder icon. Drag the icon for one folder (or file) onto the icon for another folder (or disk) and then release when the second icon is highlighted, as shown, top. The first folder will then be inside the second folder. Put another way, the first folder is now a subfolder of the second folder. This technique works regardless of whether the second folder’s window is open. Drag an icon into an open folder’s window. 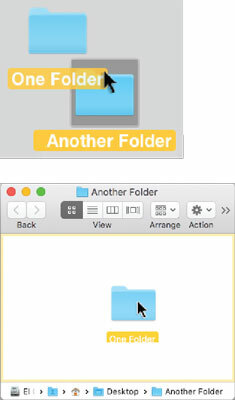 Drag the icon for one folder (or file) into the open window for a second folder (or disk), and then release it when the second folder’s window is highlighted in yellow, as shown here (bottom). Two ways of putting one folder into another. If you want to move an item from one disk to another disk, you can’t use the preceding tricks. Your item is copied, not moved. If you want to move a file or folder from one disk to another, you have to hold down the Command key when you drag an icon from one disk to another. The little Copying Files window even changes to read Moving Files. Nice touch, eh?